The last stuff pack I bought before my hiatus was a disappointment. So I had no expectations for this one. But it’s not bad. Of course, I picked this one up 2 years after it came out, at a reduced price, so I guess I am finally getting value for money. There are a few new outfits, three new hairstyles and a couple of random new objects. 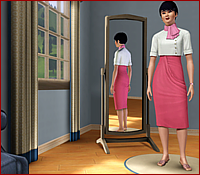 And: new rabbitholes for your sims to disappear into.The outfits are a bit ‘out there’, but they are at least different from what I had so far. Variety is important in a game that is as visual as The Sims 3. 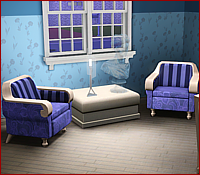 I like that there is another modular sofa to play around with. And that there are objects for all ages and all themes. There is new sports stuff, new bookish stuff, a new sink and some outdoor play equipment for kids and the young at heart. I don’t like that there are some objects for the whole washing of clothes. I hate laundry in real life and still cannot understand why it has been added to the game. All in all, a stuff pack worth picking up at reduced prices. And you might get lucky! If you do spot it on the shelves for a couple of euros off the original price, and you are like me, coming back to playing the game, go on: it will add new flavour to your game.